Whether you've purchased a car before or this is your first time buying a vehicle, make sure you take a look at the safety features of the car you're considering. It's vital that you choose a car designed to keep you safe as you drive. You'll be spending a lot of time in your vehicle, so choose something with your comfort and safety in mind. 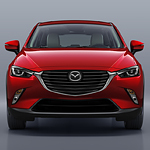 The Mazda CX-3 offers a number of important safety features, including a Smart City brake support system, child safety locks, rear cross traffic alert, and advanced blind spot monitoring. You won't have to worry when you drive this car. It's got everything you need to take care of yourself and your family while you're on-the-go. Find out more by visiting us at Thompson Mazda today. We'd be happy to help you schedule a test drive.